"1360 N Sandburg is situated adjacent to a small park and walkways that are great if you have pets or just want to stroll or sit outside and read a book." 1360 N Sandburg Terrace - Cummings House - is part of the Sandburg Village community of buildings in the Gold Coast. The 28-story building contains 324 condos and has a sister building adjacent at 1355 N Sandburg. The building offers studio, one bedroom and two bedroom units. 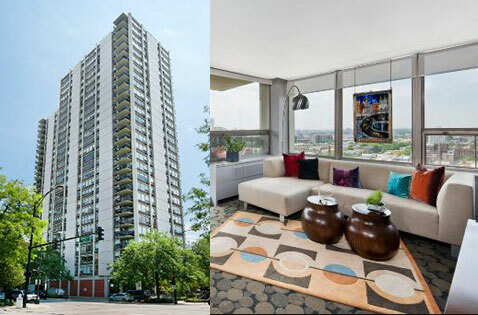 In addition to the 24-hour doorman and building roofdeck, 1360 N Sandburg residents enjoy access to the other great amenities of Sandburg Village including tennis courts and 2 pools. 1360 N Sandburg does allow pets and leased parking is also available to residents.